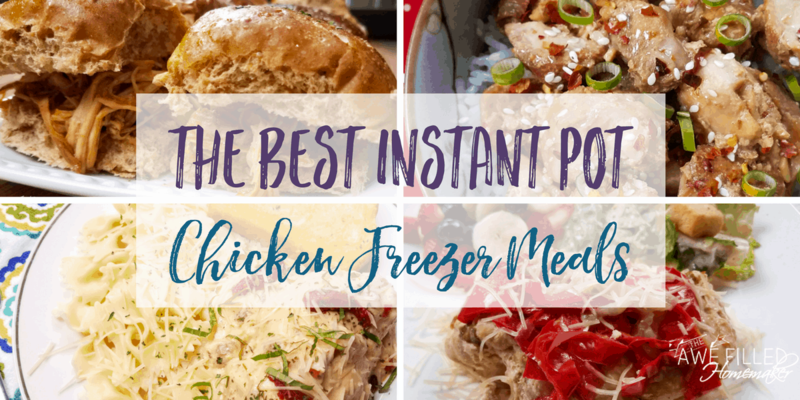 This week my Instant Pot Flu Fighting Chicken Soup and my Instant Pot Flu Fighting Chicken Soup with Spaghetti Squash soup stood out from the rest. Our family has been sharing stomach bugs, influenza, coughs, and colds. Unfortunately, it seems to be happening to all my family and friends, especially this time of year. I needed to whip up my flu-fighting chicken soup with spaghetti squash. 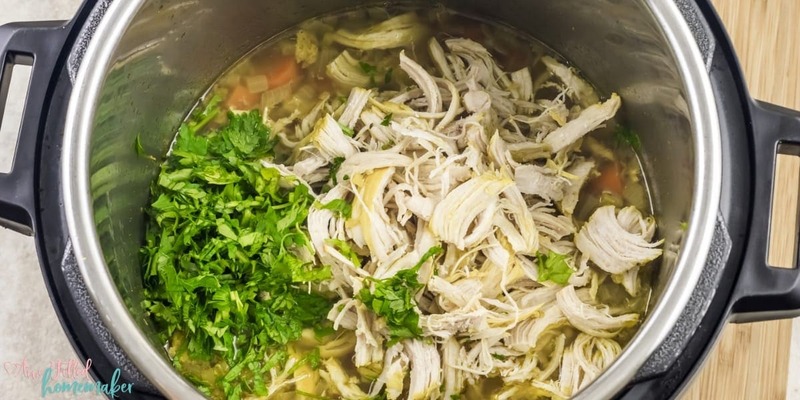 My recipe is a chicken soup that is low carb, gluten-free, grain-free, soy-free, dairy free, and paleo. Try to say that three times fast! But really, this soup recipe is a game changer. We were out in the crowds this last week, and I can’t tell you how many people I heard or saw coughing or sniffling along the way. My goal for the new year was to try our best to stay healthy and attempt to hide from every cold and flu lurking around the corner. I got our cold and flu fighting immune systems revved up by whipping up a batch of my chicken soup with spaghetti squash and served it up. My soup is a warm, comforting and full of vitamins and nutrients to help fuel our body and protect us from those unwanted illnesses. Best of all, this is a meal I felt good about serving to my family. It is loaded with nutrients, protein, fiber, veggies, and, best of all, a wonderful taste. Don’t get me wrong, I love my classic Flu Fighting chicken noodle soup, but this lighter version hit the spot on the days I felt the worst. If you don’t have gluten-free noodles, but still want a low carb meal, don’t sweat it. I created this recipe because many of us don’t carry gluten-free noodles or low carb ingredients. The key to a low carb soup is to swap regular noodles with spaghetti squash. Although squash takes a little more time to prepare, the texture is similar to pasta and I love the flavor of spaghetti squash. 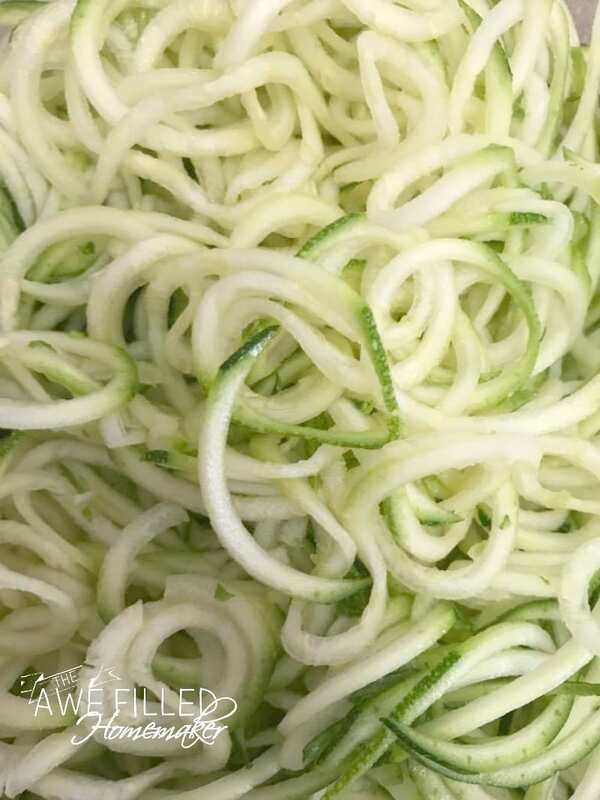 If you are not a fan of spaghetti squash, you can also reach for zucchini noodles or kelp noodles in lieu of the squash. Both options will still make this recipe low carb and gluten-free. 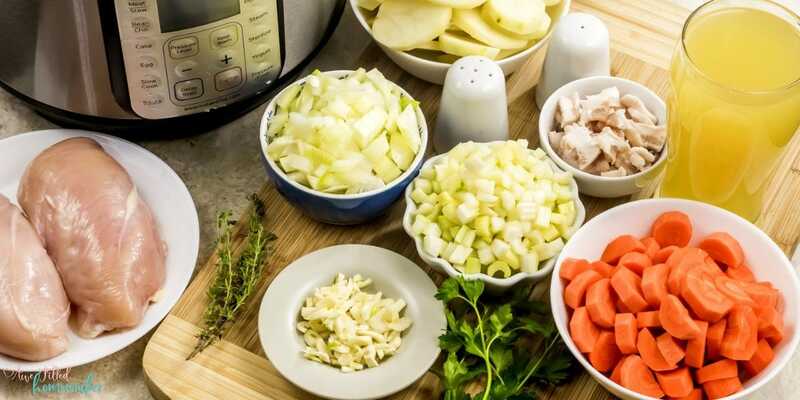 If you don’t want to spend the time making the soup recipe all at once, here are a few ways to prep ahead of time to cut down on the time involved in making the soup. 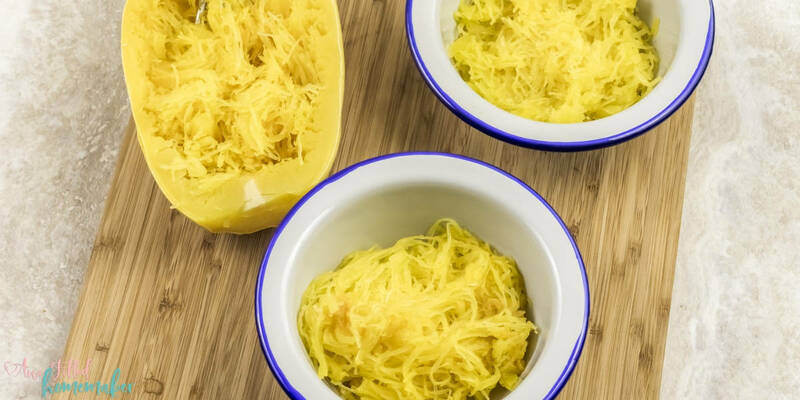 Spaghetti Squash | You can always pre-make your spaghetti squash the night before or even earlier in the day. Just follow directions on how to cook spaghetti squash, shred it, and then put in an airtight container in the fridge. 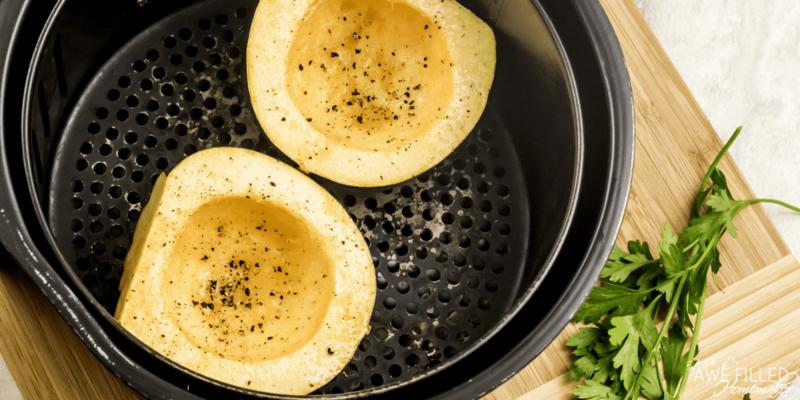 Did you also know that you can fix spaghetti squash in the air fryer?! 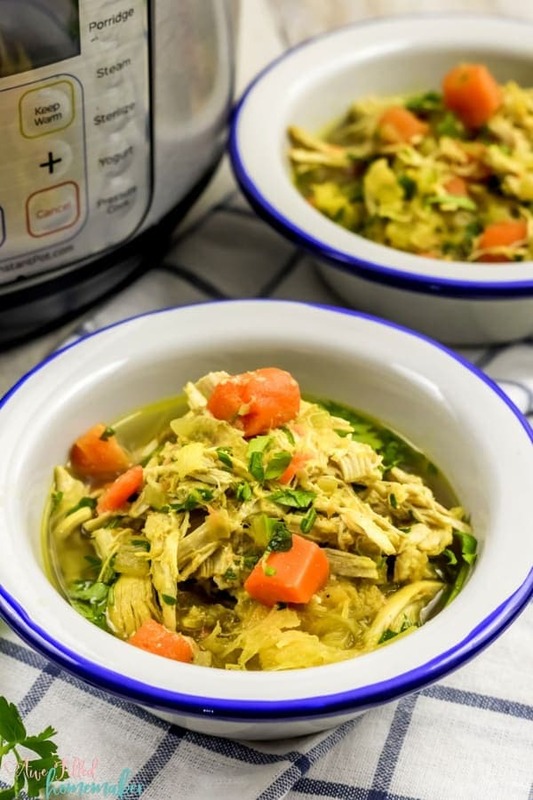 Chicken | You can either use leftover chicken from a rotisserie chicken or even bulk cooking chicken in your Instant Pot. Either way cuts down the time making the soup on the day you want it. 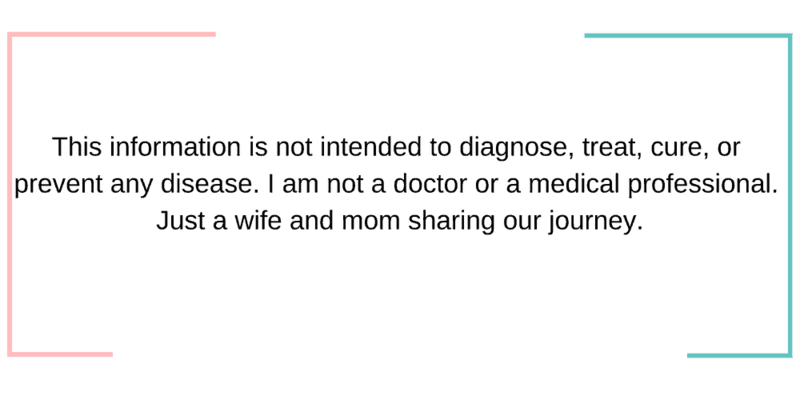 I have used both of these methods in the past when making this recipe. 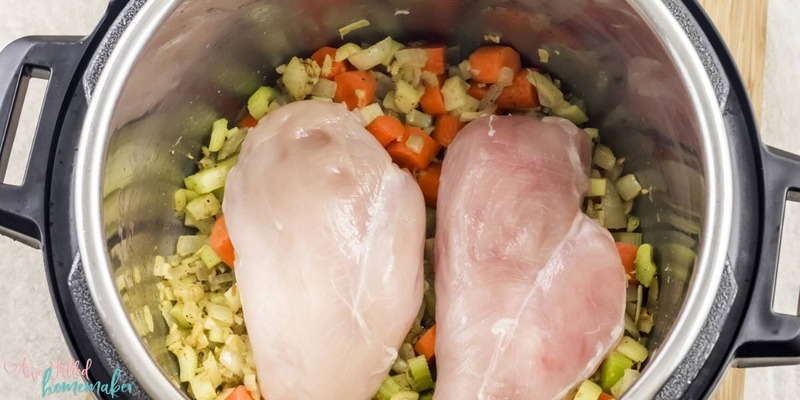 However, if you’re using precooked chicken, ensure it doesn’t contain a lot of other seasonings. This could throw off the taste of your soup. 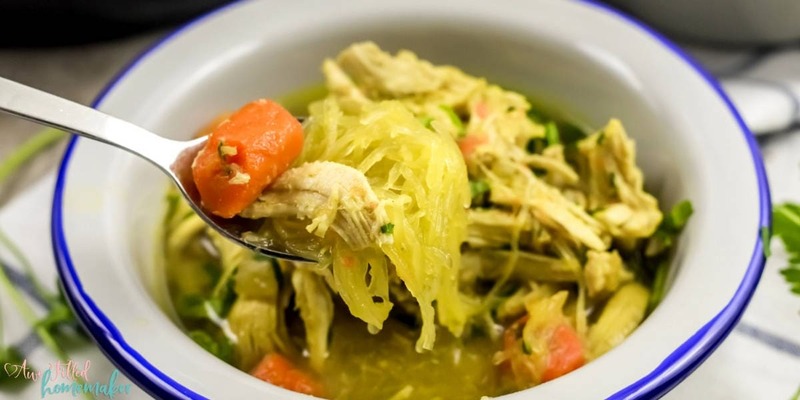 This Flu Fighting Chicken Soup with Spaghetti Squash should be on everyone’s menu this cold and flu season. But, better yet, keep it on hand anytime you get a craving for a comforting bowl of soup. 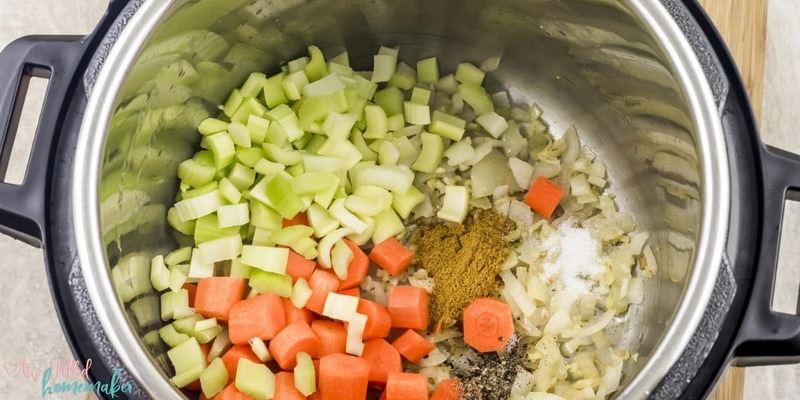 This soup is satisfying and light and is allergy friendly to most. 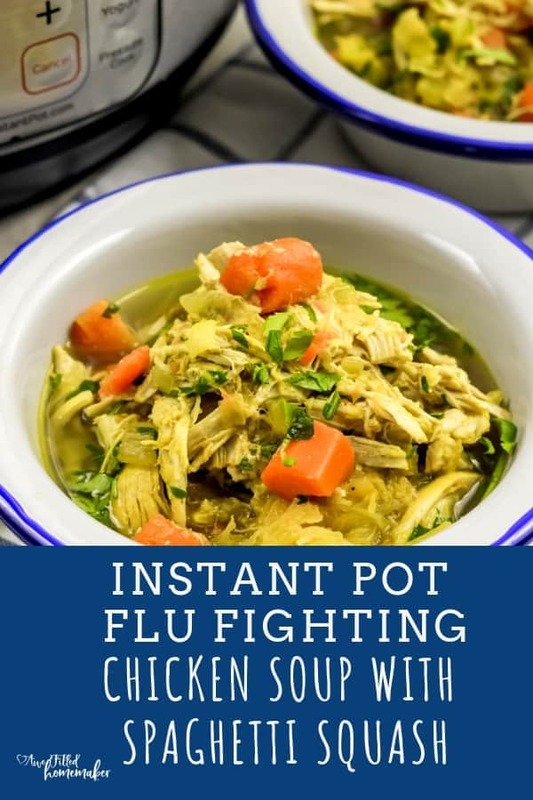 You can also add a splash of hot sauce to add spice and help clean out your nasal cavities if you are fighting a cold, or even sprinkle with red pepper flakes to add some heat to the dish. 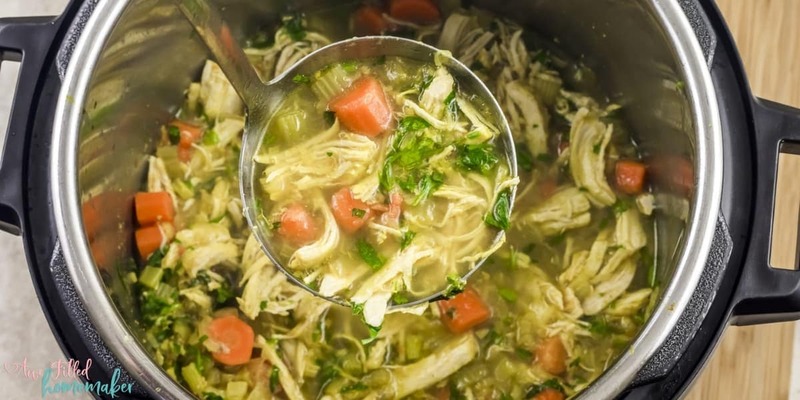 We love serving this soup with a side of gluten-free dinner rolls or a side salad. 1) Cut the spaghetti squash into half and remove the seeds and the stringy membranes. 3) Place the squash halves on the trivet. Make sure the water does not touch the squash. 4) Select the “Pressure Cook” mode and adjust the time, with the “- / +” to 5 minutes. 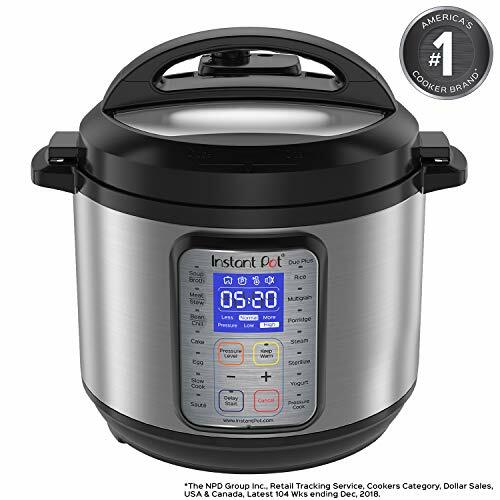 5) When Instant Pot beeps, let the pressure release naturally. It will take about 10 minutes. 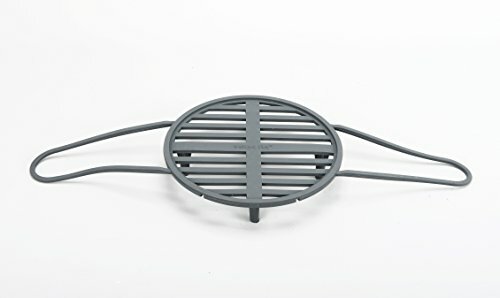 6) Carefully take out the trivet and let the squash cool for 10 minutes. 7) Once the squash is cool enough to handle, using a fork, shred the squash into long, thin, ‘spaghetti’ strands. 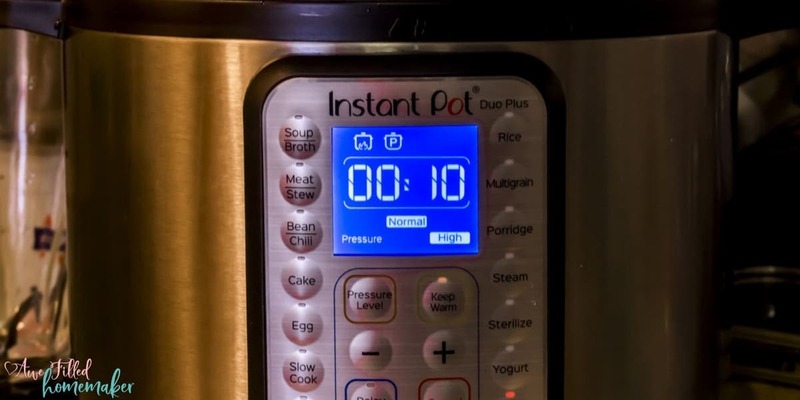 8) Clean the instant pot insert and turn the Instant Pot on the ‘Sauté’ mode. Let the Pot heat up for 2 to 3 minutes or until the display shows ‘HOT’. 9) Add the oil or butter followed by the chopped onions, grated ginger and minced garlic. 10) Sauté for another 4 to 5 minutes, till the onions caramelize. 11) Next add the celery and the carrots, along with ground turmeric, salt and freshly cracked pepper. Give it a good mix. 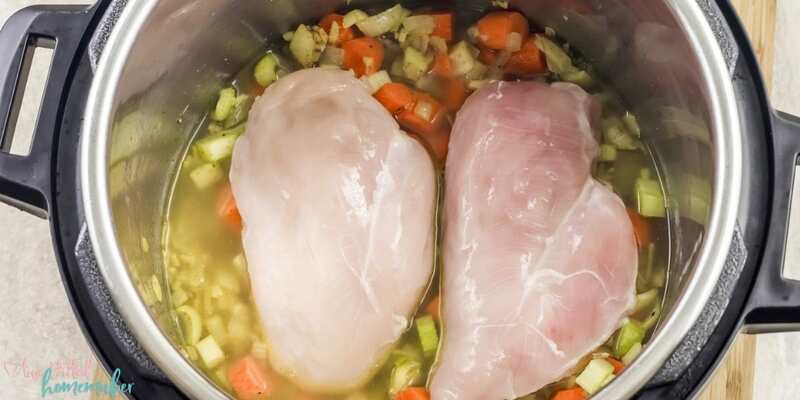 12) Place the chicken breasts over the vegetables. 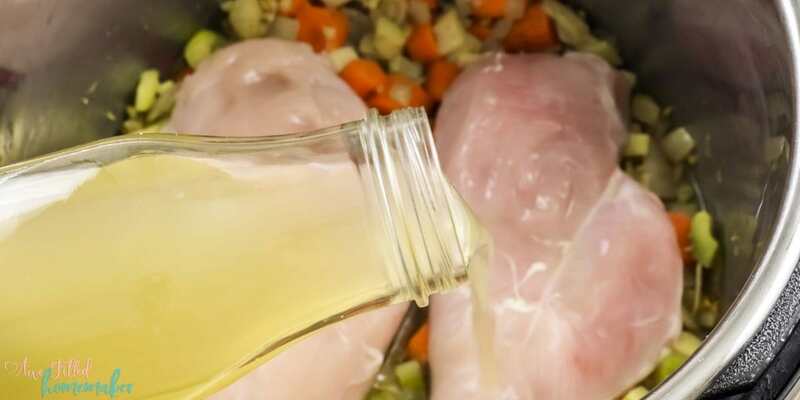 13) Add the chicken stock. 14) Turn off “Sauté” mode. Put the lid on, making sure that the pressure valve is in the “Sealing” position. 15) Select the “Pressure Cook” mode and adjust the time, with the “- / +” to 10 minutes. 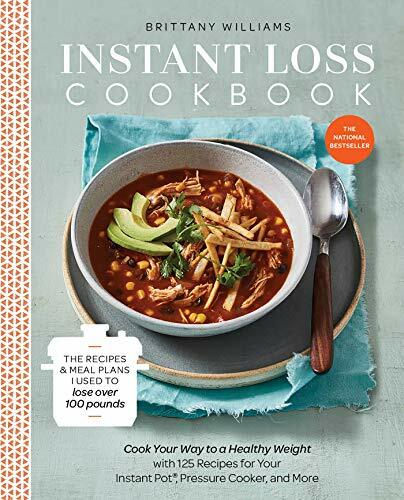 16) When Instant Pot beeps, let the pressure release naturally. 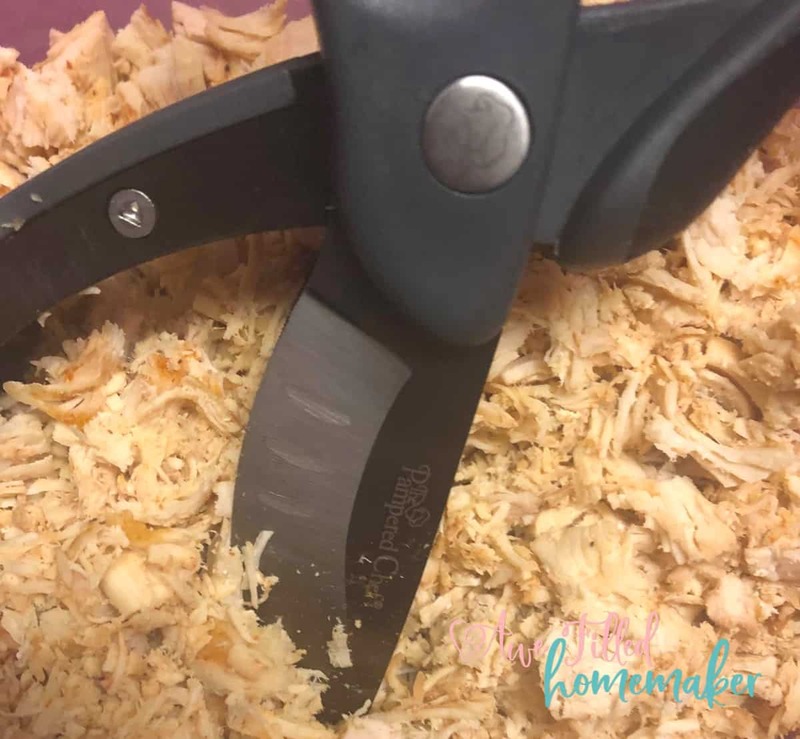 17) Remove the chicken breast and shred it with two forks OR use a pampered chef salad shredder—-this is AMAZING by the way for shredding chicken! Here’s a terrible cell phone image using my Pampered Chef Salad Chopper. While the image is TERRIBLE, lol, the chopper is AMAZINNNNG! I will try to get a new picture soon with my good camera for you! 18) Turn on the “Sauté” mode and add the shredded chicken along with chopped fresh parsley. Simmer for 5 minutes. Check for seasoning and adjust the salt and pepper accordingly. To serve: Place about of cup of spaghetti squash strands in a serving bowl and top with piping hot soup. Serve immediately with a generous squeeze of lemon and a handful of freshly torn parsley. 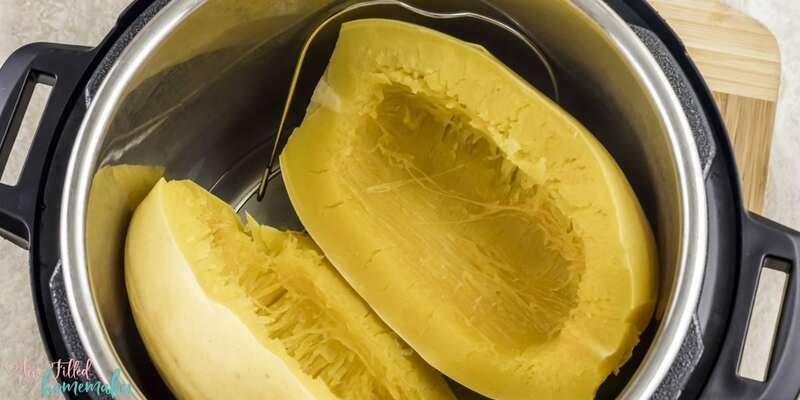 To store leftovers, store the spaghetti squash and the soup separately in the refrigerator. Warm the squash and soup separately and serve together. 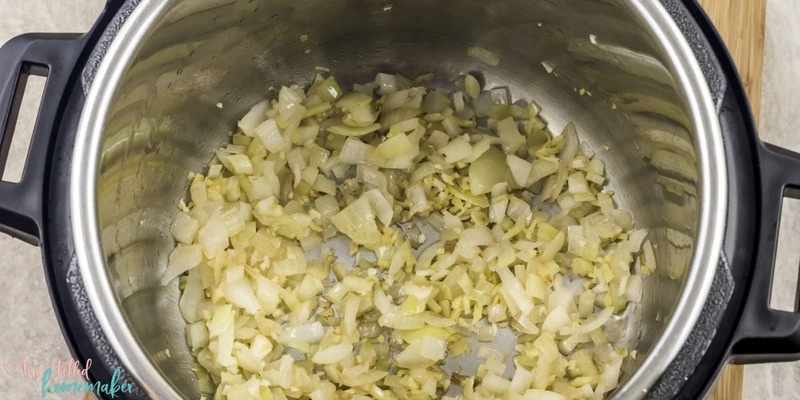 I hope that you enjoy this low carb version of this delicious soup! 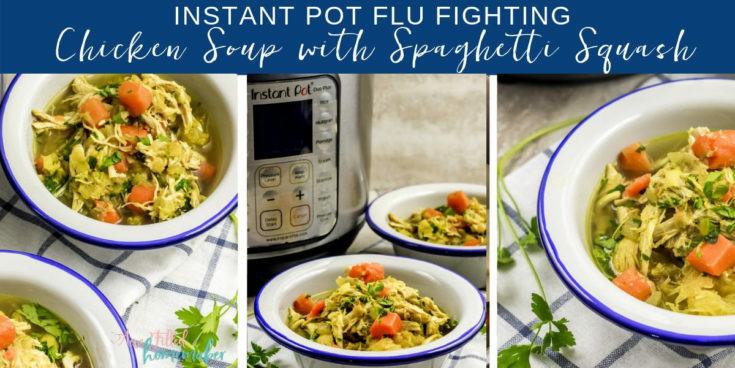 Either way, with pasta or low carb- this is the perfect recipe to have on hand to help comfort you or your kids when sick. 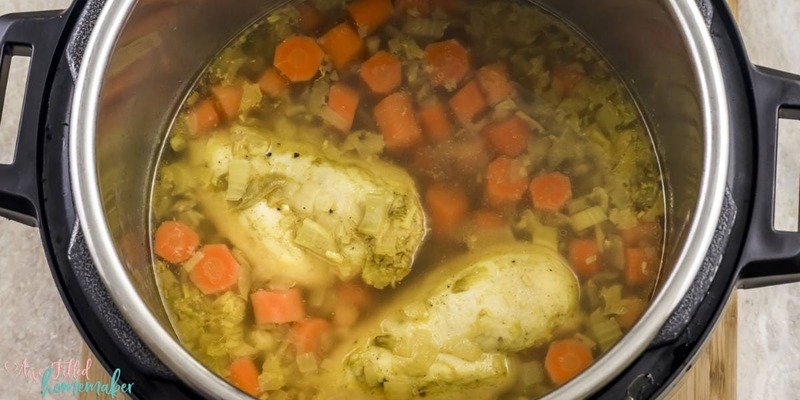 Chicken soup that is low carb, gluten-free, grain-free, soy-free, dairy free, and paleo. Cut the spaghetti squash into half and remove the seeds and the stringy membranes. Place the squash halves on the trivet. Make sure the water does not touch the squash. Select the “Pressure Cook” mode and adjust the time, with the “- / +” to 5 minutes. 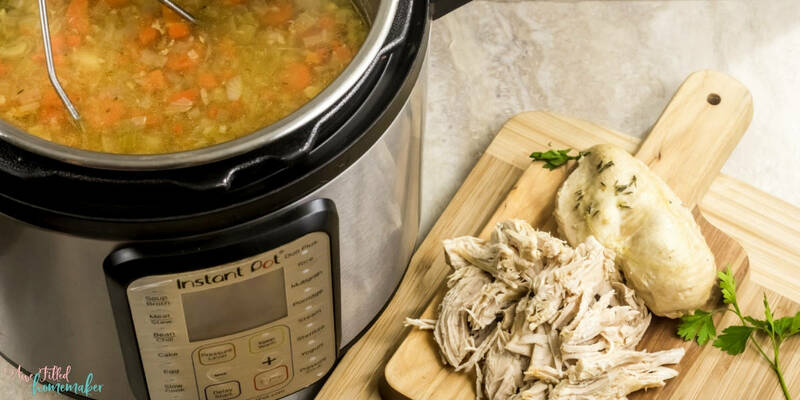 When Instant Pot beeps, let the pressure release the naturally It will take about 10 minutes. Carefully take out the trivet and let the squash cool for 10 minutes. Once the squash is cool enough to handle, using a fork, shred the squash into long, thin, ‘spaghetti’ strands. 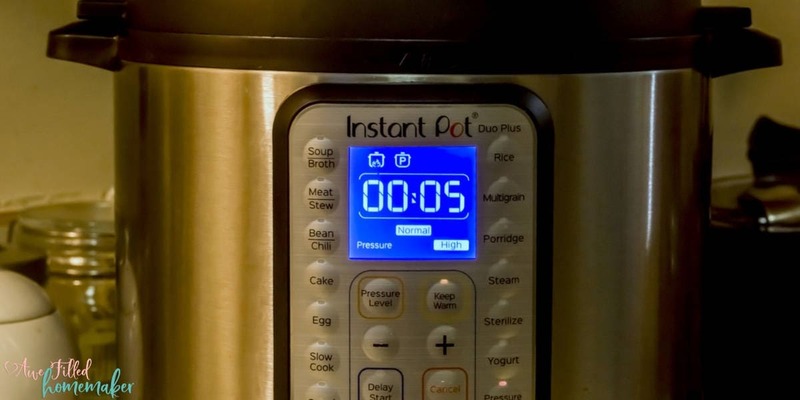 Clean the instant pot insert and turn the Instant Pot on the ‘Sauté’ mode. Let the Pot heat up for 2 to 3 minutes or until the display shows ‘HOT’. Add the oil or butter followed by the chopped onions, grated ginger and minced garlic. 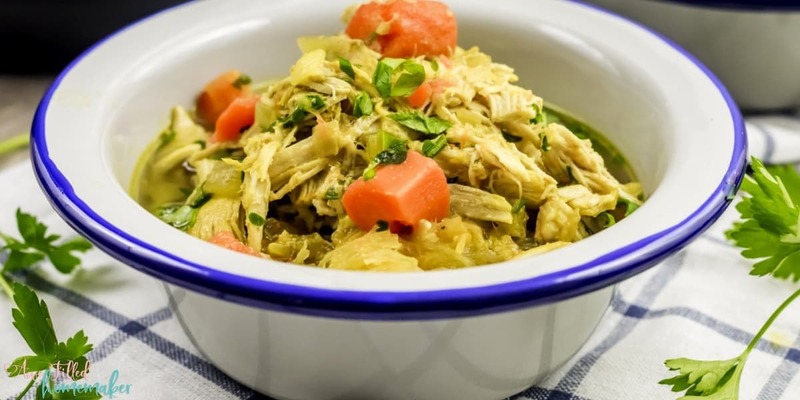 Turn on the “Sauté” mode and add the shredded chicken along with chopped fresh parsley. Simmer for 5 minutes. Check for seasoning and adjust the salt and pepper accordingly. 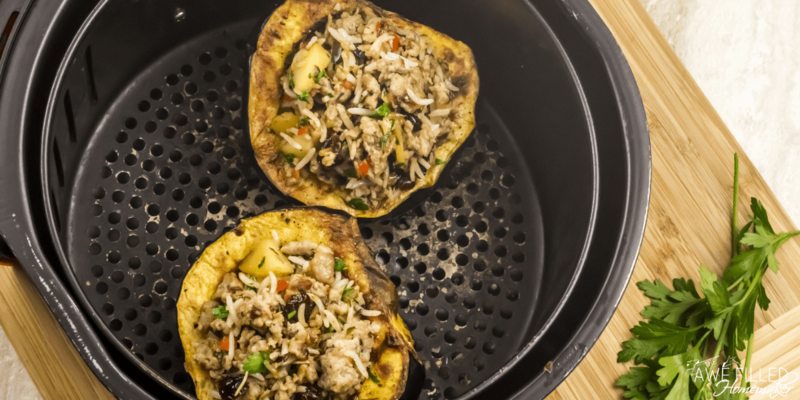 To store leftovers, store the spaghetti squash and the soup separately in the refrigerator. Warm the squash and soup separately and serve together.